I hope you are all in your happy place, because despite the afternoon sunshine, it is somethin' outside. I'll avoid complaining about it, I know you've probably absorbed enough of that from your various social media channels. But walking around outside earlier (out of necessity not recreation, mind you), I did have the serious thought that I should move somewhere warm. Ahem. Anyways. I have no formal food review - seems I've been sticking with the tried and true lately - but have a few bright spots to share with you. First, Original Roomie A. visited on her way back to the big city after the holiday. Cannot get enough of Original Roomie A! We tried to go to Blue Spoon for brunch, but it's a Saturday-only brunch. Damn! On a pretty-picture-lead from Map & Menu, we went to check out Vignola. My only experience there was a long time ago, and it did not inspire me to return. Sadly, brunch confirmed it. Pretty, but nothing special. 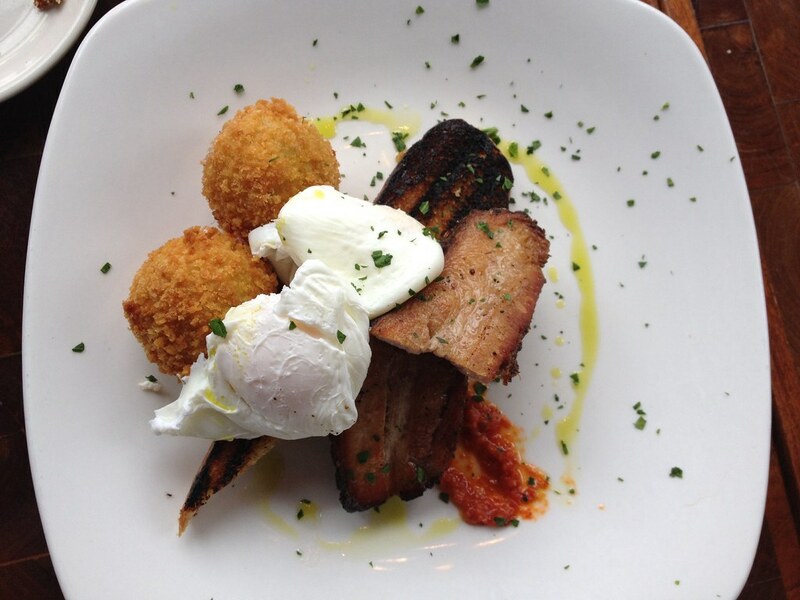 This is poached eggs with pork belly, potato croquettes, charred toast, and a tomato conserve ($11). While there's nothing outright wrong with the dish, it just fell a little flat. The pork belly was a little tough, the eggs a little overdone, and the tomato was the most interesting thing on the plate. And at what point does 'charred' become 'burnt'? Again, nothing worth speaking up for, but compared to other brunches around town, not worth repeating. Before you get too into lusting after this next item, know that Small Axe truck has closed for the season, so you'll have to wait til Spring. But file it away, because this is a must-have. I found the truck in their usual spot behind Tandem Coffee Roasters on their last Saturday of the season. "We're out of sausage!" Karl hollered from inside the truck. "But we have Spam! And bacon!" I looked at the menu and saw that it was homemade Spam, made from pork belly. Uh, sounds like sausage only better to me. 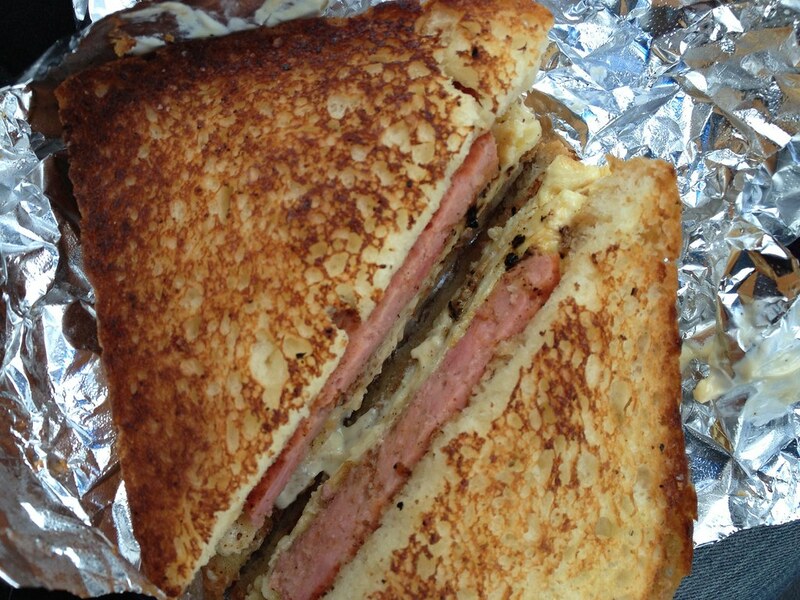 So I ordered the egg, Kewpie mayo, Spam sandwich on 158 Pickett Street Cafe bread. And it was delicious. I am just a huge fan of everything that comes out of this truck. Plus they're so damn nice. OK, love affair with Small Axe truck delayed until next Spring. Fine. I joined my friend LBK for lunch a b.good in the Old Port one day before some Christmas shopping. I think she actually cackled mirthfully when she found out that she had been to this new burger joint and I hadn't. I enjoyed a beef burger made up in the style of "Cousin Oliver" which is lettuce, tomato, pickles, and raw red onion. Classic guy, that Oliver. And of course, some fries. Apparently these fries are baked, which is pretty incredible, since they were tasty and crispy. 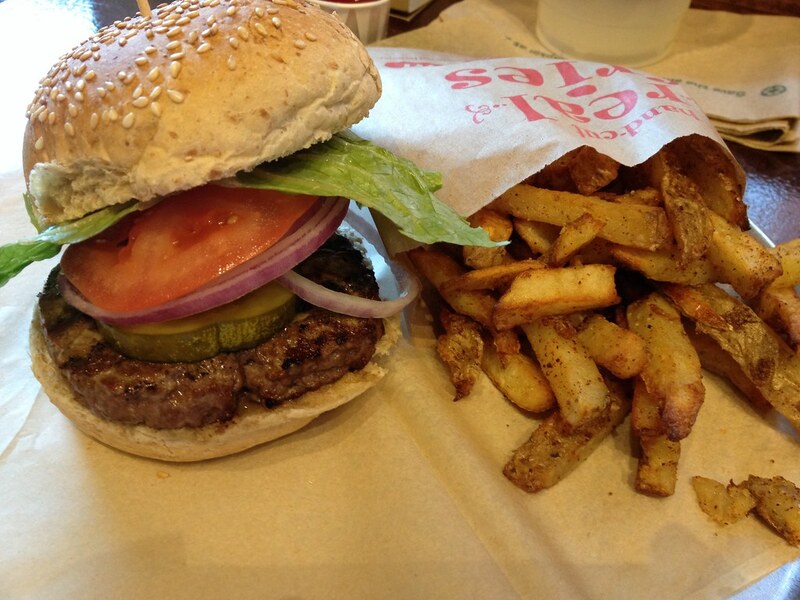 My burger was nice and juicy, and a great portion - I could eat most of it without feeling stuffed. And best of all, my stomach didn't hurt after lunch, whereas if I'd eaten Five Guys, I'd be hurtin' (it'd be worth it though). LBK was happy that she could get something other than burgers. They have a selection of salads and sides of veggies, which you can add curls of shaved Parmesan cheese to. I was impressed, and if I worked downtown, I'd eat lunch here frequently. Instead, it's the sad strip of Route 1 in Falmouth for me. Hope you have a snow day today or at least found a way to enjoy this wallop of weather we just had.